At NASA's Kennedy Space Center in Florida, space shuttle Endeavour is bathed in light as it awaits its early-morning liftoff at Launch Pad 39A on Wed., June 17, 2009. Editor's Note: This story was updated at 4:50 p.m. ET toreflect additional statements from NASA. Contrary to the previous report, NASAdenies it is undertaking any effort to look specifically for sabotage. NASA does not suspect sabotage was behind the glitch thattwice delayed the launch of the space shuttle Endeavour recently. The agency is investigating all possible explanations forthe problem, but has no specific processes to search for intentional tampering,officials said. "NASA is not concerned about sabotage at all,"NASA spokesman Kyle Herring said. "They develop a detailed fault tree totry to come to a conclusion as to what the problem is. The program leaves nostone unturned in an investigative effort. There is never a fault tree that hasa block in it that?s labeled sabotage." Endeavour's STS-127mission was supposed to lift off June 13, but a leak of hydrogen gas from apipe attached to the shuttle's fuel tank kept the vehicle grounded. NASA triedto launch Endeavour a second time on Wednesday, but again the leak appeared,even after workers replaced the leaky seal between the pipe and the shuttle. The shuttle will now stand down until at least July 11 whileinvestigators probe the cause of the failure, which also delayed the shuttleDiscovery's STS-119 mission in March. That flight managedto blast off four days later than planned, after the seal swap-outapparently stopped the leak. So far, the root cause of the issue is mysterious. 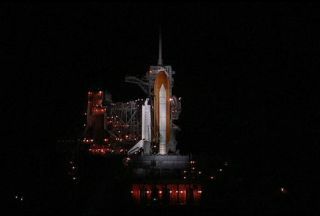 "We've got to step back and try to understand thisproblem," space shuttle deputy program manager LeRoy Cain said in abriefing after the second Endeavour delay. "I'm confident we will do that.We will be relentless in terms of trying to understand what's going on withthis system." While NASA fully expects to find a technical glitch atfault, its investigative processes will be able to detect any human-introducederror as well, if it occurred, Cain said. NASA plans to retire its three aging space shuttles in 2010,though its next-generationspaceship, called Orion, will not be ready by then. The agency began cuttingshuttle-related jobs last month and expects to have to lay off asignificant number of workers after the last shuttle flies. Because eachshuttle launch delay has ripple effects on future scheduled flights, the stallwith Endeavour has the potential to extend the shuttle fleet's end date. NASAis mindful that some workers may be under stress due to the situation. "We have talked a great deal about those kinds ofpotential issues," Cain said. "And I think we're taking measures thatare commensurate with the circumstances that we have here as we go forward thissummer and for the rest of the shuttle program for sure." He said he doubted anyone on staff would try to sabotage theprogram. "I think that we've got a highly professional workforce here, and to a person, at least when I talked to them, they're in thisbusiness because they love the work that they do and they love to support thehuman spaceflight endeavor." A case of sabotage hasoccurred before, with a subcontractor working on the 2007 flight ofEndeavour. NASA discovered a space station computer box that was intentionallydamaged, with cut wires. They were able to repair the damage with no illeffects to the flight. In this situation, though, NASA has stressed that there isno reason to suspect intentional tampering, and they are not taking anyparticular steps to investigate this possibility. "We trust the people who work on this program and we'lldo anything we can to help them understand and correct a problem," Herringsaid. "We know it?s a dedicated work force. Any problems of any kind wewould uncover through our normal checks and balances." In response to any suggestion of sabotage, United SpaceAlliance, a major NASA contractor on the shuttle, released a statement. "Any suggestion that our workforce would do anything tointentionally hinder a safe and successful launch is grossly irresponsible andcompletely off-base. The entire shuttle team worked extremely hard making thenecessary repairs and preparing Endeavour for the July 17th launchattempt.? It is a testament to their dedication, commitment and skill that thevehicle was in a position to go for the second attempt. Neither USA nor ourNASA customer has any reason to suspect any wrongdoing of any kind, and thereis no investigation being undertaken."